Easter is a bit over a month away and as you start getting out boxes of bunny laden decor, here is another idea for you. Take a look at our Pin of the Week that originates from this post by Texas based handbag designer Kara Whitten's blog Kailo Chic. Such a simple idea for the little ones to eat a healthy lunch and get in the mood for the festive season. Filling each egg with a different treat offers a surprise that just may encourage your child to eat something new. But be sure to fill cups with familiar foods as well and a sweet treat (or two!). I love this idea. It is recycling at it's best and can be done year after year with a proper washing and some imagination. 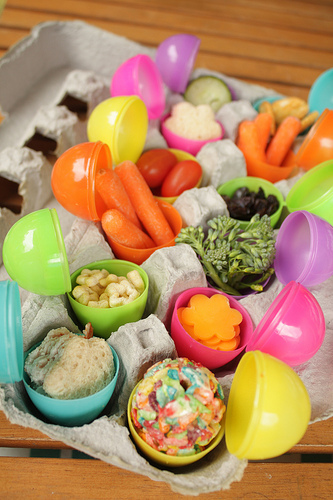 Other ideas: You can serve Easter lunch like this as well or even pop an egg or two in your child's lunch. They absolutely love things like this and it doesn't take you much time to prep.